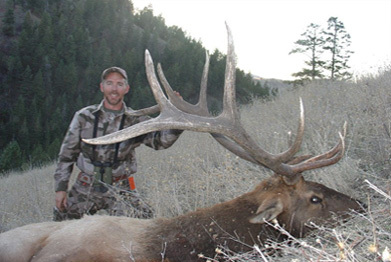 One of the longest running outfitters in Idaho: Tim Craig (#71), BCO (#93), out of over 1,400. Dedicated to hunting excellence for 30 years. Been with Buckmasters since 1989 -- 20 consecutive years! Been hunting on the same ranch since 1985. The first outfitter in Idaho to have an exclusive license to outfit on private land. Largest private ranch licensed by a single outfitter in Idaho (over 60,000 acres). Idaho is one of the few states with exclusive licensed hunting areas and guaranteed allocated tags. We have one of the largest exclusively outfitted wilderness areas in Idaho (approximately 600 square miles). Boulder Creek Outfitters operates under special use permits on the Clearwater and Nez Perce National Forests (Idaho); and the Humboldt and Toiyable National Forests (Nevada). Boulder Creek Outfitters is authorized to conduct commercial guiding activities on all BLM administered lands in Elko, Winnemucca, Carson City, Ely, Battle Mountain, and Las Vegas (all Nevada). We also have the most guaranteed allocated tags of any outfitter in Idaho. Numerous Boone and Crockett animals, in 4 different species, have been taken over the years with Boulder Creek Outfitters. "Big bucks get my attention! Boulder Creek Outfitters is the place to go for some awesome Western Whitetail action."